44th Annual Rochester Academy of Sciences Fall Scientific Paper Session. November 11, 2017, St. John Fisher College. ASA Annual Meeting presentation. October 23, 2017. Yanai, R.D., Gonzales, K.E., Goswami, S., Li, S., Fisk, M.C., and Fahey, T.J. N vs P Limitation: A Factorial Fertilization Experiment in Temperate Hardwood Forests. 54th Annual HB Cooperators Meeting. July 11-13, 2017. Slideshows available. Hong D. S., A.D. Wild and R.D. Yanai. 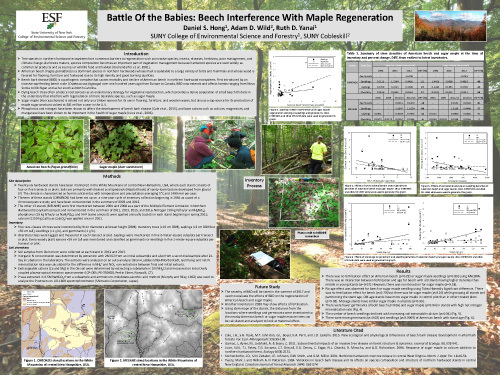 Battle of the babies: Beech interference with maple regeneration. Lasser, G. A., D.S. Hong, Y. Yang, K.E. Phelps, G. Pu and R.D. Yanai. 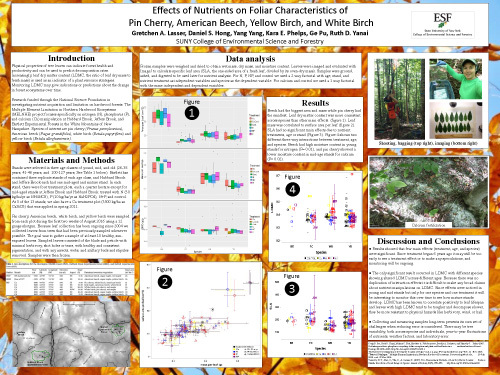 Effect of nutrients on foliar characteristics of pin cherry, American beech, yellow birch and white birch. Morley, M.S., C.G. Sosa, and R.D. Yanai. 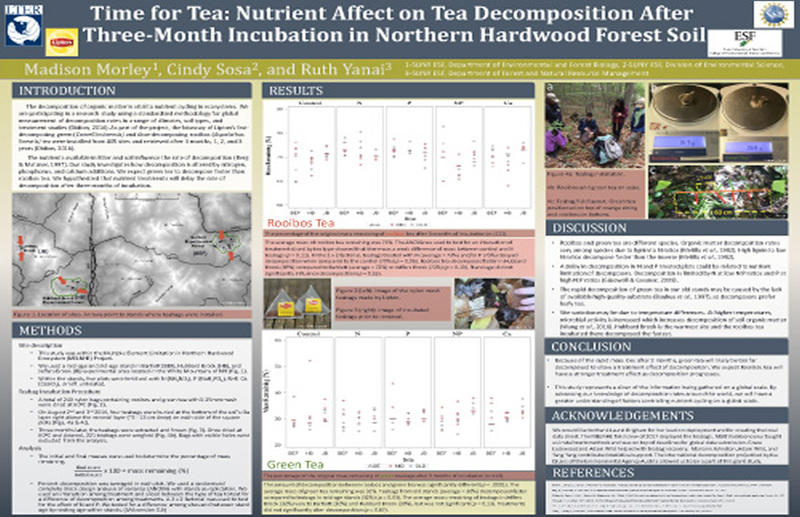 Time for tea: Nutrient on teabag decomposition after three-month incubation in hardwood forest soil. During the Biological Weathering Symposium, Dr. Ruth Yanai gave a presentation entitled "Comparison of Current and Long-Term Ca Weathering Rates in the White Mountains of New Hampshire." 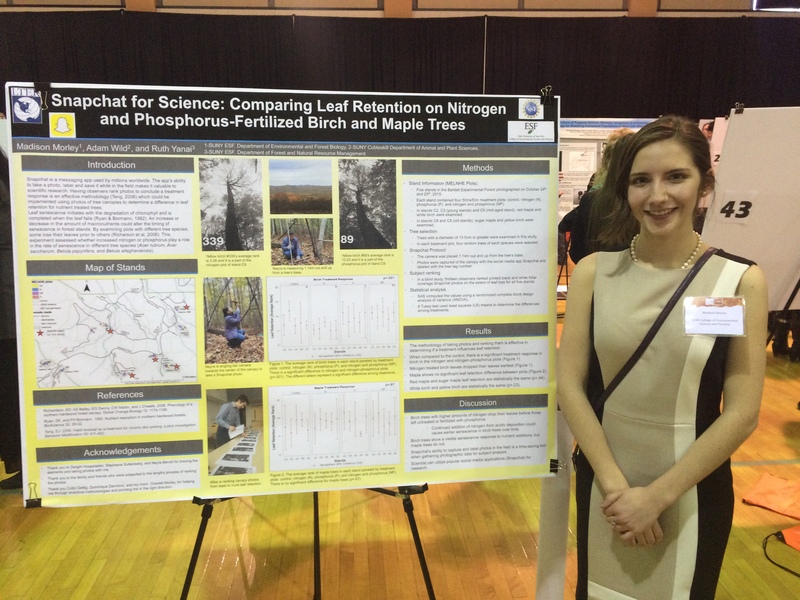 MELNHE featured at 2015 Central New York Science & Engineering Fair, Mar 22, 2015. Max Charlamb, a 9th grader at Manlius Pebble Hill School in Dewitt, NY, has been working with Dr. Ruth Yanai, through a Research Assistantship for High School Students supplement to analyze project data. 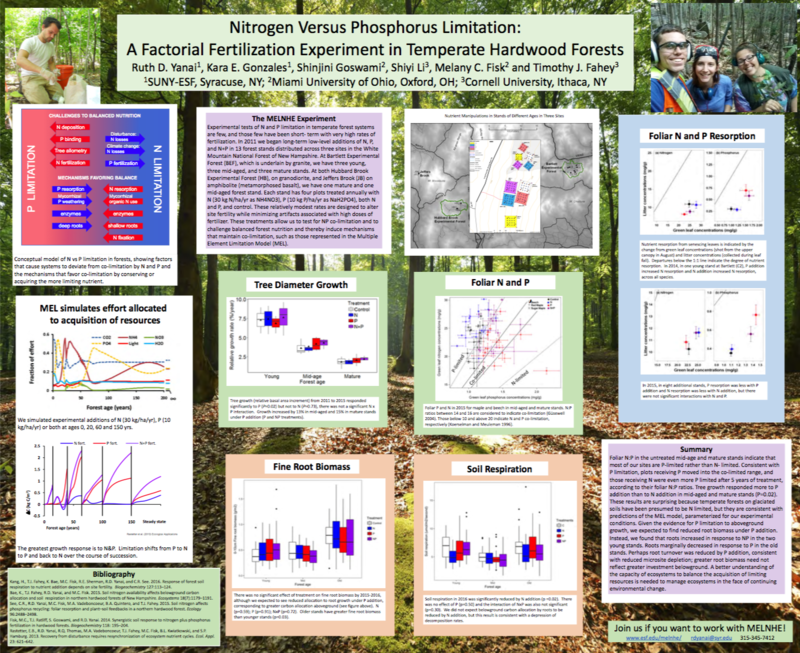 His poster entitled "Is phosphorus more limiting than nitrogen to foliar production in Northern Hardwood Forests" earned High Honors in the Senior Division (grades 9-12). He concluded that data do not support the hypothesis that foliage production would increase with P application more than with N. At the older sites, litter production seemed limited by N availability. The CNYSEF accepts projects from students in grades 4-12 from public, private and independent schools and homeschooled students in Onondaga, Madison, Oswego, Cayuga and Cortland counties. The Fair is one of several annual STEM competitions administered through the Museum of Science and Technology, located in downtown Syracuse's historic Armory Square. Research Program for High School Students enrolling for the 2015-16 School Year, for students attending ESF in the High School partner schools. While enrollment is a rolling basis, 40 hours in the ESF's Forest Ecology Lab must be completed by the end of the academic year. Work sessions are scheduled most weekends, and during a number of school breaks. Participants work with Dr. Ruth Yanai, her graduate students and undergraduate Research Aides, and with students in city and suburban districts. Former Tech puts MELNHE background to work in Home School Program. 2014 Field Season Underway! Read more at the field crew's blog. First Sign of Foliar Nutrient Response to Fertilization. Adam Wild provided a project update at the spring Hubbard Brook Committee of Scientists, April 22, 2014. Sugar maple foliage shows the effect of N and P addition at Jeffers Brook. The CaSiO3 addition resulted in higher Si but not higher Ca in foliage at all sites. Adam Wild presents capstone (below) and defends thesis, Soil Nutrients Affect Sweetness of Maple Sap, SUNY ESF, Syracuse, NY, April 8, 2014. Research Spotlight. Senior Conservation Biology major Nathan Donato presented his independent research project "Influence of Soil Calcium and Stand Age on the Structure and Functional Diversity of Arthropods: A Case Study in Two Northern Hardwood Stands " at SUNY ESF's annual Spotlight on Student Research, the April 16, 2014. The two sites were represented by the MELNHE plots at Bartlett and Jeffers Brook. Nathan found that arthropod richness and Shannon-diversity (functional groups were used instead of species level) were highest in the mature Bartlett plots, although overall arthropod abundance was higher in mid-age Bartlett stands. He worked with the interdepartmental team of Cheryl Bondi, a PhD candidate in the Graduate Program in Environmental Science; Melissa Fierke, an Associate Professor (Entomology) in the Department of Environmental and Forest Biology; and Colin Beier, a Research Associate (Ecology) in the Department of Forest and Natural Resources Management. Franklin Diggs' Capstone Seminar, Contrasting Mycorrhizal Guilds through the Soil Profile, SUNY ESF, Syracuse, NY, January 9, 2014. He successfully defended the thesis, and is feverishly working to complete that document. Craig See's Capstone Seminar, Soil nitrogen affects foliar phosphorus resorption in a co-limited system, to the Department of Forest and Natural Resources, SUNY ESF, Syracuse, NY, November 13, 2013. He also has defended, submitted his thesis, and started as our part-time short-term Research Support Specialist. Congrats on all counts, Craig, especially that MS! McLin presents at HB REU meeting, August 2013. Megan McLin, Tougaloo College, was a late addition to the crew, so her project wasn't included among those discussed at the Annual Cooperators Meeting. Her project was near enough to completion to be included in the HB REU meeting that followed (below). She continued to develop her results, entered a report in the Tougaloo Undergraduate Research Symposium. She took home 2nd place and $50. The judging was based on topic, quality of research methods etc, captivation of audience and knowledge of research. Congrats, Megan! Poster: Zahor,. Lily E., Michele L. Pruyn, Mark B. Green,Geoff Wilson. 2013. The Impact of Calcium on Transpiration in an Acid Rain Impacted Forest. Plymouth State University Office of Research & Engagement Student Showcase, April 27, 2013. Abstract: Acid rain has impacted New England forest for over 60 years. Acid deposition causes calcium to leach from soils, which is problematic for forests because calcium is broadly important to healthy plant function. We applied calcium fertilizer in the form of wollastonite (CaSiO3) ,attempting to replace leached Ca. Previous forest responses to wollastonite application have shown increased health, growth, and survivorship in hardwoods. Through a whole watershed experiment, it was shown that Ca addition can temporarily increase forest water uptake. However, the mechanisms behind this response remain uncertain. Tree transpiration can be measured by monitoring sap flow volumes. Using the Granier method, a heated probe is inserted in the sapwood above a reference probe enabling the calculation of sap flux. New England are primarily northern deciduous, dominated by American Beech (Fagus grandifolia), Yellow Birch (Betula alleghaniensis) and Sugar Maple (Acer saccharum). Our research goal was to study sap flow in these species to determine whether adding Ca will increase tree transpiration and productivity across sites in the White Mountain National Forest in New Hampshire. Summer 2012 preliminary data showed an increased sap flow at a Ca treated versus control sites in the Hubbard Brook Experimental Forest. Continued study is underway for the 2013 season with two additional sites of differing levels of available Ca in their soils. Understanding how forests react to replacement of lost Ca via wollastonite will help land managers understand the impacts of acid rain on forest function and develop appropriate management strategies. Maps. 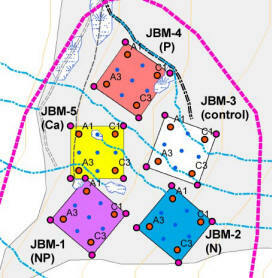 Matt Vadeboncoeur, who produced project maps for the Calcium Project, has updated maps for the multiple elements now being evaluated for their potential to be co-limiting. Now that plot locations have been finalized, maps of what's within each plot (i.e., baskets, collars, MRs, and soil-sampling subplots) will be underway. Login to view individual maps. MELNHE at the HBEF Meeting, July 6-7, 2011. This project will be well represented at the 48th (!) Annual Cooperator's Meeting of the Hubbard Brook Ecosystem Study, hosted at the Robert S. Pierce Laboratory, Hubbard Brook Experiemntal Forest, Woodstock, NH. Presentations address: Finally funded and fertilizing: Predicting tree growth rates in response to altered N and P availability in the Shoestring Study (Shinjini Goswami, doctoral student, Miami Univeristy); Chop it down: Reducing uncertainty in tree height measurements (Lin Liu, undergraduate student, ESF and Sichuan University); Young and old stands differ in N vs. P resorption from leaves, consistent with MEL model predictions (Craig See, masters student, ESF); The Shoestring Satellite Experiment: N, P, and what about K? (Mariann Johnston, Assistant Professor, Forest Technology Program, ESF); Beech bark disease, past and future (Christy Tanner, REU student, Linfield College); Nutrient additions affect ecosystem water use: Plans for measuring sap flow in trees (Neal Smeltzer, undergraduate student, Colorado College); Nutrient availability affects soil respiration and belowground carbon allocation in northern hardwood forest of the White Mountains of New Hampshire (Kikang Bae, doctoral student, ESF); Popsicle sticks and filter papers: Plans for cellulose and lignin decomposition experiments (Amos Lim, undergraduate student, ESF); Mycorrhizal colonization of roots: soil depth and species composition (Franklin Diggs, master's student, ESF). There is also one project poster: Why is soil respiration higher in urban forests than rural forests? (Russell Auwae, doctoral student, Miami University). Stay tuned as these presentations become new MELNHE Research Highlights! Several collaborators will present work from concurrent projects during this jam packed meeting. Schedule. Team members please note: Shoestring Meeting at the Hubbard Brook Cooperators Meeting, Thursday July 7, 1:30pm in the lunch room. Ruth was inteviewed for a Popular Science magazine article.